This room was lined with sofas and chairs, which were covered in the same floral material which was used to cover the walls and used as curtains. 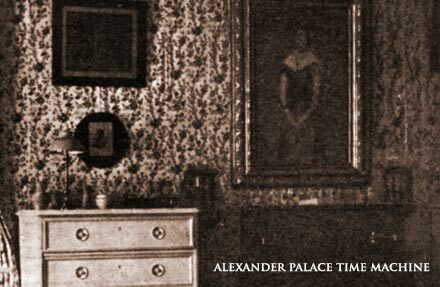 A very large painting of Alice of Hesse by-the-Rhine, Princess of Great Britain and Ireland hangs on the wall to the left. She was the children's Grandmother. There were also pianos in the room, which are out of the view of this photograph. This view shows the long vista along the windows into the Classroom, Bathroom, Bedrooms of the Grand Duchesses and Classroom, which ends all the way in the Playroom at the far end. "I spent the evening with the Empress in the mauve boudoir, and she told me how glad she was to have me near her. "I know the Grand Duchesses want you to be somewhere close to their room, so I've decided that the red drawing-room will be the best place for you to sleep. Come with me. Anastasie is waiting for us," she said. (The apartments at Tsarkoe Selo reserved for guests and the suite were situated over the third and fourth entrances to the Palace. 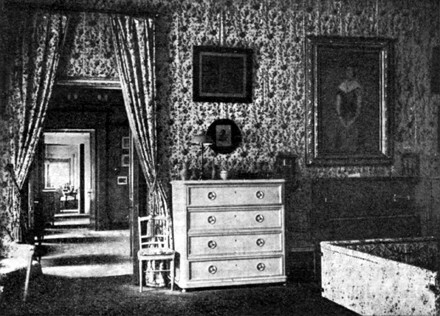 The red drawing-room was in the private apartments. - L. D.) The red drawing-room was a fine room; everything in it was upholstered in scarlet, and scarlet and white chintz covered the easy chairs. A bed had been arranged on one of the couches, and the two Grand Duchesses, with tender solicitude, had seen to the minor details themselves. Anastasie's nightgown lay outside the coverlet, Marie had put a lamp and an ikon on the table by the bed; and a snapshot of Titi, taken from their collection of photographs, had been hastily framed, and occupied a place next to the holy ikon. How dearly I loved them all... how glad I was that I was privileged to share their danger! The Empress left me with Anastasia, as she wished to see Count Benckendorff, so Anastasie and I sat down comfortably on the red carpet, and amused ourselves with jigsaw puzzles until she returned."